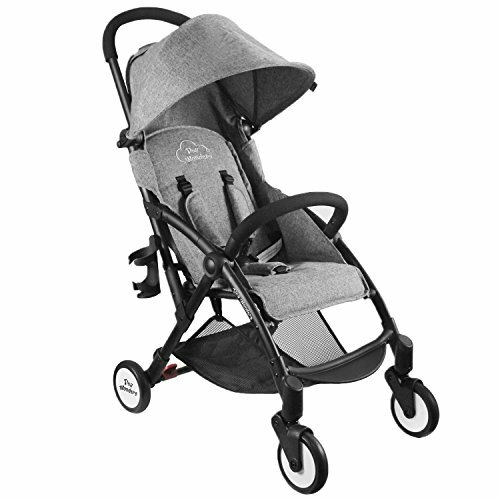 The Tiny Wonders pram/stroller is every parents dream - a lightweight, modern, pram/stroller that can be managed with one hand while holding the baby in the other. The open process is - lift the locking mechanism, hold the handle, and give a slight flick and it is fully opened. The closing down is just as simple, lift locking mechanism, and lightly push the handle down, and it fully folds. Product dimension: 18" x 9.5" x 23.5"
Packing dimension: 19" x 10" x 24"
LARGE CANOPY - Three tier, extended canopies for maximum UV protection, or a small light rain. There is no need to take an additional umbrella for your kids. A peek-a-boo window so you can easily keep a watchful eye on your baby. Extra-large easy access storage basket, enough to accommodate & holds all the necessities of the baby, which is safety under the seat of the stroller. There is a cup holder(even a juice bottle) that parents can use it when the fell tired and thirst. SPECIAL NOTICE: PLEASE CONFIRM THE STROLLER WAS GET STUCKED WELL BEFORE YOU PUT YOUR BABY INTO IT. THE STROLLER SUPPORT WITH BUGGY BOARD OR GLIDER BOARD. If you have any questions about this product by Tiny Wonders, contact us by completing and submitting the form below. If you are looking for a specif part number, please include it with your message.